Sandburne Cottage Self-cateringSandburne Cottage has a peaceful air with panoramic views and is a delightful cottage with many personal touches which will add to your holiday comfort at any time of the year. The Keswick area abounds with wonderful walking - Skiddaw and Blencathra and the Borrowdale fells beckon the more experienced whilst the less active will find delightful valley rambles amid some of Lakeland's most stunning scenery and, of course, a cruise on picturesque Derwentwater is not to be missed. Built in the 19th century Sandburne Cottage is the middle property of three set well back from the road in an elevated position with sweeping views to the south and west. Accommodation: Entrance into small hallway then to a most pleasant sitting room (40" LCD TV, DVD, video, CD player, wi-fi broadband, electric fire) with large bay window. Main hallway which can also be used for dining, leads through to the sunny, double glazed conservatory which will surely be the focal point of any holiday at this cottage. Doors to small rear garden area - garden furniture provided. Well-equipped fitted kitchen in natural woods. Downstairs wc. Upstairs there are three bedrooms - a charming double room, again with wonderful views and two other rooms - the larger one can be made up as a single or a twin (please advise us at the time of booking). Third room is a single. Bathroom with bath/over bath shower and additional hand-held shower, basin and wc. Fitted carpets throughout. Storage heaters and panel heaters throughout. Sandburne Cottage is lovingly cared for and beautifully presented with every thought for your holiday comfort. Many little extras are included - fresh flowers will usually be supplied and a bowl of fruit and a 'welcome' tray will make you feel immediately at home. DVDs/CDs, books, games and up-to-date magazines all add to the holiday feel. Outside: Doors from conservatory lead out to small rear garden area with garden furniture. Parking for two cars to the front of the house. Keswick centre approx 10 minutes walk. Sorry no pets * non-smokers only please * duvets/beds made up for arrival * towels provided but please bring own towels for swimming * free wi-fi broadband * electric cooker * microwave * dishwasher * fridge and freezer * auto washer/dryer * house telephone * all fuel included * high chair available - please order. Sorry - no cot available. Electric by meter reading first £10 included 01Nov end March, 2 free days at the Lodore Leisure Club. Children welcome from any age. 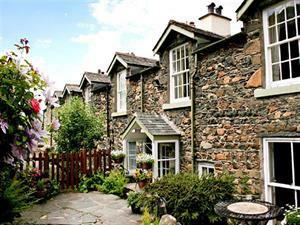 Sandburne Cottage offers weekly bookings starting on Saturday.